When the Avalon Hotel opened in 1949, it was a revelation on the bucolic edge of Beverly Hills, where it’s slightly hidden behind the dense foliage. After a revamp over 15 years ago, designer Kelly Wearstler has been brought back, this time to update the restaurant and outdoor lounge area by the hour glass-shaped pool. The result is 1950 Jetsons with a modern twist; vintage furniture - collected from around the world - includes a Carlo de Carli settee and wood and brass dining chairs by American mid-century designer Dan Johnson. Hand-crafted, white oak tables with inlaid geometric patterns lead to a marble bar surrounded by retro iron-forged bar stools. In the kitchen, Chef Michael Hung - who received rave reviews for his stint at Faith & Flower - has rejoined the Bombet Hospitality Group for his spin on a modern American and Continental menu which features homemade linguini with geoduck and clams, foie gras torchon and rib eye steak with bone marrow gremolata. 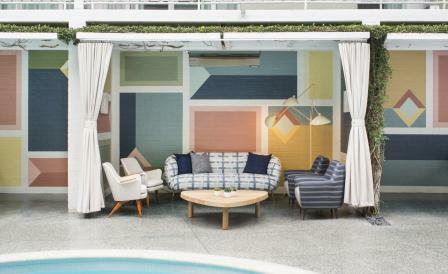 Outside, the cabanas are set against a backdrop of hand-painted trompe l’oeil patterns inspired by Italian architect Gio Ponti, providing a great perch for a cocktail by Ryan Wainwright. Here, Wearstler’s signature soufflé sofas are also accented with vintage-gilded Italian lounge chairs, Carl Gustaf Hiort af Ornäs’ 1950s beechwood chairs and Pierre Chapo coffee tables, fitting in perfectly with the Californian outdoor vibe.